For the first time in the last couple of years, we don’t have to worry about having enough space! There’s enough space here at our new location to grow. We are hiring again and getting ready to embark on new exciting projects. Right now we don’t have to worry about succeeding at our core mission. Plasmid distribution is amazingly still growing at >9% every year (12% in 2018) since 2005. We’re meeting the challenges of DNA distribution to ensure scientists everywhere can access plasmids despite the evolving export/import rules. Our shipping and lab teams continue to keep up with the demand with excellence and dedication. We don’t have worry or wonder if providing a viral vector service was a good idea. The scientific community is loving it. Almost 10,000 viral vector samples were distributed in 2018 and we are poised for more offerings. The viral vector team is publishing research, hosting conferences, and are expanding our catalog of materials to better serve the community. We are delighted at the early outcomes and the ecstatic reception by scientists. The success of these projects allows us to support more new projects. Diversification is happening. The Addgene team will have some fun challenges this year and I’m excited about this, but definitely not worried. I have confidence that from Business Development to Shipping we will execute any new projects with our usual quality and success. We must keep spreading the word about materials sharing, but we don’t have to worry about getting support from depositors. We regularly hear how much they see the value in depositing and they are increasingly seeking us out on their own to share reagents. I love the way scientists starting their own labs get excited about making their first deposit to Addgene. We are also lauded by another set of stakeholders - the tech transfer community. In a recent law review article we received some entirely unsolicited praise: “Addgene, for one, is a sterling example of collaboration and innovation between legal and scientific fields.” Thanks to our legal team, and great customer service, somehow we have scientists actually loving the MTA?! Scientists know about Addgene and our visibility is increasing internationally, thanks to evolving outreach tactics, increasing business development efforts, and our London team. We show up in both science journals like Nature and in mainstream media like The Atlantic. We’ve been in documentaries in 3 languages (Japanese, German, and English) and even on 60 Minutes. We are blessed with a large community of scientists who support us by depositing, requesting and spreading the word. Our blog and site resources are just killing it for scientists. Our website is visited by the scientists who request from us but also by high school students and industry scientists as a universal resource for information and data. Speaking of the website, we now have a UI/UX team. Last time I checked we were ranked as the 21,806th most popular website in the world. I know, right? Upgrades to the internal LIMS pages and excellent work on our external website appearance and functionality are happening and this strengthens our image in the world. 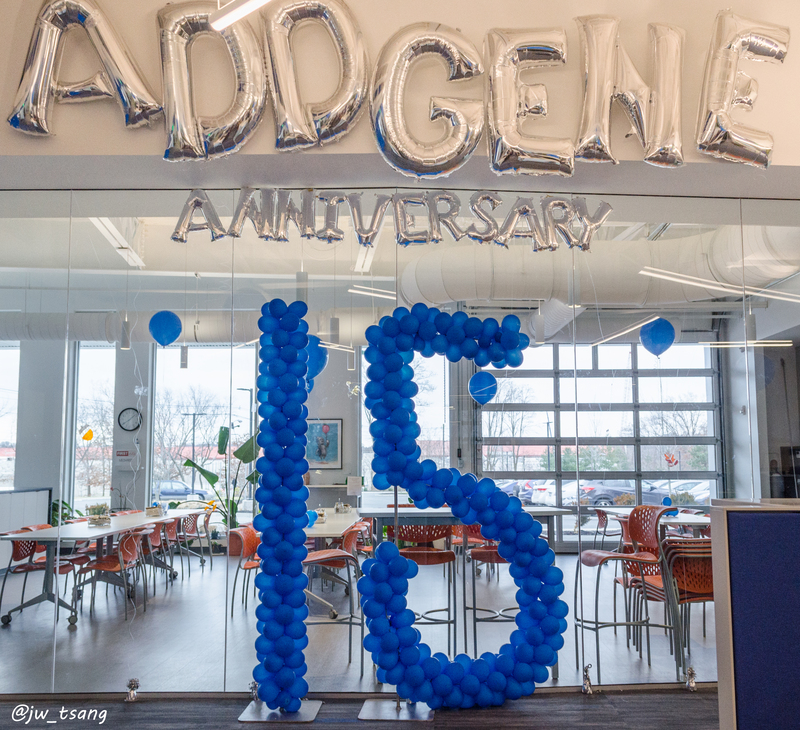 Addgene is now as much a tech company as it is a reagent company. I used to have to worry about this a lot, but not any more! Our product and software teams are working in lock step to maximize the services and features we can offer online for Addgenies and to serve external customers. I also can’t wait to see where our new data initiatives take Addgene. There’s so much potential for service and contribution! On an organizational level, we keep passing our audits with flying colors. While of course always being vigilant about resources, I’m not worried about the stewardship of this in the hands of our finance team, now 3.5 Addgenies strong. 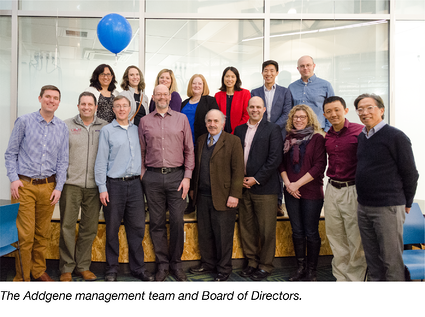 The Addgene Board of Directors is mature and poised to support our growth. Thanks to Joanna Brownstein (our outgoing Chair) and Dave Root (incoming Chair) and our entire supportive Board, we have a robust committee process in place and continue to incorporate additional Board best practices. I thank them wholeheartedly for their service and support. The Addgene management team leads with excellence. They are one of the main reasons I have so few worries and can often focus on the excitement of what we are accomplishing and what more we might do. I am grateful every day for their dedication, flexibility, innovative thinking, and openness to team work. Once in awhile I worry a very little bit about hiring when we need to do it quickly. 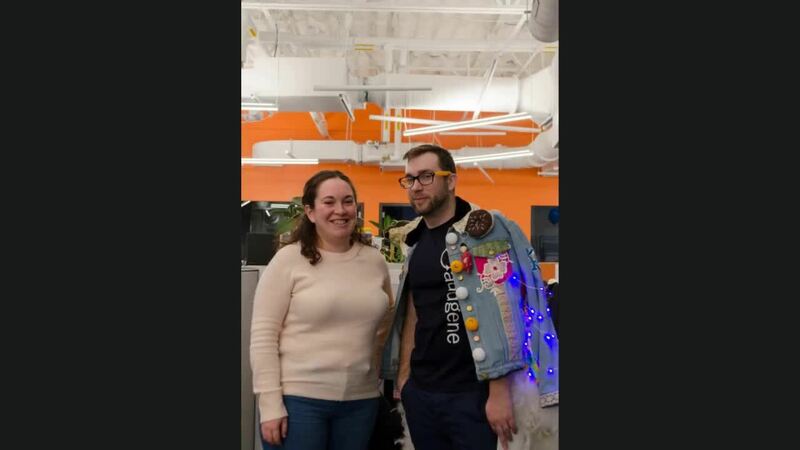 Hiring is hard but as a 3 year Boston Globe and BBJ Best Place to Work with a positive, supportive culture, we are attractive to the local employee pool and we get a lot of successful candidates from internal referrals. Our long reaching reputation helps us hire great people from farther away via connections and even via Twitter. We love working with local organizations like Just-a-Start, the Northeastern co-op program, and with other intern positions. We have an awesome talent pipeline. Turnover at Addgene is about half of what is standard in most sectors. The Addgenies support a high collaboration, high communication, high efficiency, high quality, low meeting, and low email culture. I like working here and I hear from the Addgenies that they do too. Ever watchful, but I’m so proud of our culture. HR here works for the Addgenies and I believe they know and trust this. We’ve introduced cutting edge practices and benefits and these are making a difference. We serve scientists around the globe and our own staff is starting to reflect this diversity, remarkably so for a 90 person company. We were and remain ahead of most companies in creating a welcoming, inclusive workplace for everyone. We had Unbiasing Training in place before it was cool or a necessary result of the #MeToo movement. We are carefully attentive to genuine inclusion, but not worried because we are ahead of the curve on this. Addgene’s success is about the Addgenies. I never worry about their dedication, excellent intentions, or incredible drive to succeed. Thanks to all the Addgenies and congratulations to current and alumni Addgenies on our success. Thanks to our amazing team, we also don’t have to worry about being able to do good in the world. We are making an impact.